Category Archives for "Crystal Methamphetamine"
Methamphetamine, also known as chalk, ice, or speed is one of the most common and highly addictive illicit drugs on the streets today. The drug is believed to increase the level of dopamine in the brain, a chemical circuits associated with the mind’s reward, motivation and pleasure systems. The fact that its effects are short-lived forces most individuals to snort or inject themselves with the chemical several times a day in a bid to maintain this state of mind. How then can you tell if someone you love is using meth? Here are five visible signs of meth use apparent in individuals new to the drug and addicts alike. Meth is categorized as a stimulant and is associated with increased brain activities that disrupt an individual’s sleeping patterns. The sleep disruption primarily depends on the stage of meth use and may range from odd sleeping hours to a state of sleeplessness spanning several days or weeks. Monitoring a suspected user’s sleeping hours may, therefore, help confirm or dispel any suspicions with regards to whether they are on meth. The illicit drug is also attributed to the loss of appetite and in effect accelerated weight loss. The pleasurable state of mind associated with the substance abuse often inhibits normal brain operations thereby resulting in a host of such adverse effects as loss of appetite. Like most other stimulants, meth use, even with first-timers results in exaggerated mannerisms like excessive chats with anyone while making little to no sense. In most cases, a user also tends to neglect such essential aspects of their life like grooming and personal hygiene. You might also notice sudden mood changes that shift from seemingly happy face to angry outbursts in split seconds, even with historically non-violent individuals. Apart from dopamine, meth use is also associated with increased adrenaline levels, responsible for arousal. Its use, therefore, increases libido and boosts stamina for sexual interactions pushing these individuals to engage in illicit sexual relations that make them susceptible to a host of infections. 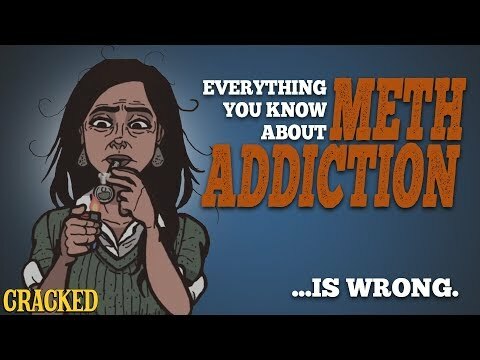 The highly addictive nature of meth can push an individual from a regular user to an abuser and then addict in a matter of days. As they step deeper into meth use tends to take a toll on their finances as individuals without a regular income flow embark on a borrowing spree after disposing of their valuables. The earlier you are able to detect meth use with your loved ones, the higher the chance of faster recovery. If you suspect someone is using meth, consider keeping a close eye on them and compare their behavioral changes with these signs of meth use if you hope to save them before they fall into addiction. Methamphetamine, also known as speed, ice, crystal, glass or meth, is a strong CNS stimulant that is synthetically produced through a complex chemical procedure and it is the second most spread drug after cannabis in US, Asia, and Oceania. Europe is not so fruitful ground for this drug; the traces of this drug can be found in the Czech Republic or Slovakia but not in great amount. Meth is usually in the form of powder although it can be in the form of paste or crystal. Depending on the form, the drug can be injected, snorted, smoked or swallowed. The injection is the fastest way of feeling the drug and its potentials. The production of meth starts with ephedrine’s or pseudoephedrine’s reduction, while it is later mixed with various substances including caffeine. The complex chemical procedure involves the use of many household items that are a catalyst and the production often results in two types of meth; d-amphetamine and I-amphetamine. The first one is a lot more potent type of meth since d-isomer is 90% pure methamphetamine that is highly-priced on the street. Meth boosts your dopamine level, giving you a strong euphoria. It fastens your heart rate, raised blood pressure and temperature while dilating your pupils. Meth improves the overall mood, removes fatigue and tiredness and replaces them with the feelings of euphoria, power, and self-awareness. It is no wonder that they often refer to this drug as kryptonite. When it comes to withdrawal, a meth user can act in two different ways, depending on the amount of daily dose, the period of consuming, and the purity of the drug (the more pure drug is, the harder withdrawal is). The common signs are motor retardation and agitation, unpleasant dreams, fatigue, depression, anxiety, poor concentration, and irritability. However, the meth is the only drug that has huge potential for the development of psychopathological problems, including psychosis, anxiety disorders, violent behavior and cognitive deficits. As one of the most potent and widespread drugs, meth is the drug of choice for 16 million of people that severely affects your brain, emotions and cognitive abilities. It is a serious worldwide problem that leaves enormous consequences both on society and environment. The real problem is that there is no practical or approved treatment for methamphetamine’s addiction. Cognitive, psychotic and mood disorders are often reported as the consequence of the meth’s use, but there is lack of understanding in the neurobiology of meth to produce an effective therapy. Still, the patients who manage to escape the meth’s addiction are undergone to cognitive-behavioral therapy, motivational strategies, and 12 step programmes.